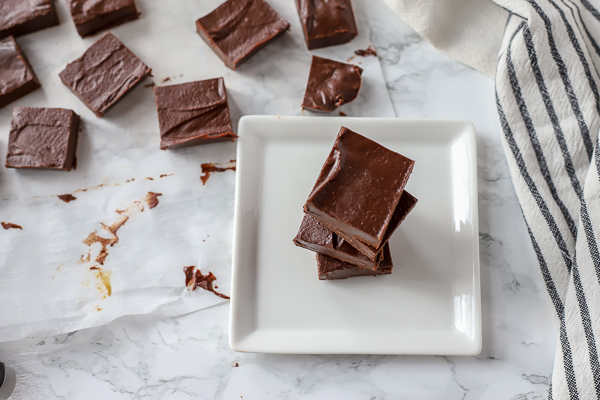 Rich, chocolaty, vegan fudge with a smooth, creamy texture… you would never believe that this simple fudge recipe is healthy, contains no refined sugar, and is paleo, vegan, and dairy free, AND is ridiculously easy and ridiculously delicious. Follow my tips below to make this fudge even better. 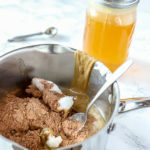 For this recipe you will need: nut or seed butter, coconut oil, cocoa powder, salt, vanilla extract, and honey or maple syrup. It seems like as soon as Halloween creeps in, candy and cookies and pies and everything in between is all you can find. At our house, we try to keep it healthy the majority of the time, but allow some room for treats. I try to keep a healthy balance. But then your three-year-old starts begging constantly for treats (and I mean alllllllll day long) and you realize you have to pull in the reigns on how many treats a little child might be getting. Anyone else deal with this? But a healthy treat is definitely something I can get behind. 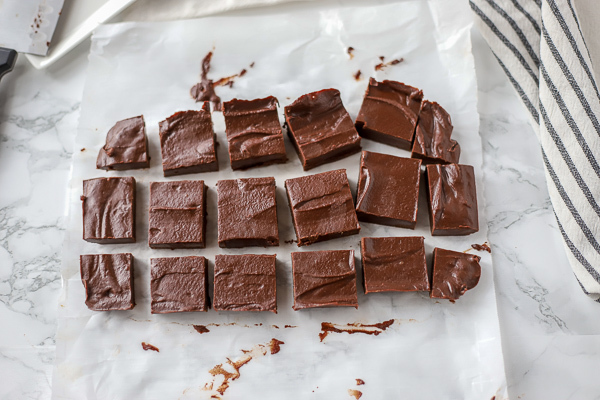 A chocolaty, sweet dessert, like this simple fudge recipe, is something we get excited about. Plus, it hits the sweet spot without that making you feel like junk. I know what you are thinking: “why vegan fudge, Amy? You aren’t vegan!” Truth! But since we are mostly dairy-free (butter doesn’t affect us like milk does), we will frequently use vegan recipes. Does it really matter, though? 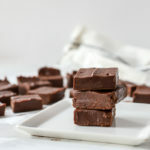 This vegan fudge recipe is actually not really new on the blog. I used a similar recipe to make these ridiculous peppermint fudge covered shortbread cookie bars. Those are so good, and you would be shocked by the ingredients. If you ever have made regular fudge, it is a process. We actually learned how to make it in college when I was studying to get my bachelor’s in nutrition… odd, right? And regular fudge is pretty tricky. 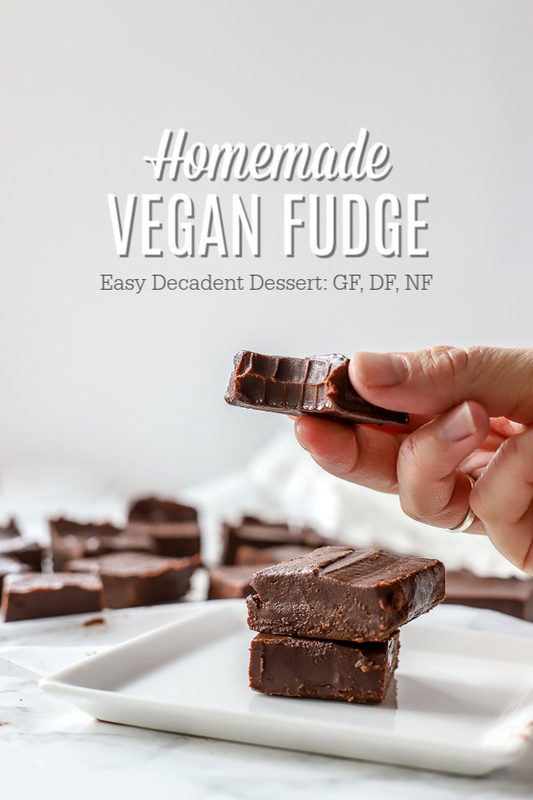 That’s why I love this super easy, vegan fudge. Fudge is really delicious, but for some reason, it always gets made during the holidays. Basically, the only time I ate fudge growing up was during the holidays, and when we went on our annual family vacation to my grandparents’ house in Florida. There was an amazing little fudge place next to the bay that we loved. As an adult, I’ve realized something… Fudge doesn’t just have to be a holiday thing or a Florida thing; I can eat it for breakfast if I so desire. Sometimes being an adult is awesome. You can use any type of smooth nut butter. If you are allergic to nuts, use sunflower seed butter. To make peppermint fudge add a little bit of peppermint extract or a few drops of peppermint essential oils. Line your pan with parchment paper to make it easy to remove and slice. Trust me. To make it truly vegan, use maple syrup instead of honey. If you use maple syrup instead of honey, then yes, it is vegan fudge. Can you use a different nut or seed butter? Yes. You can use whatever you want, as long as it is a smooth, creamy nut or seed butter. Crunchy butters would change the consistency. Does this taste like coconut? Yeah, it has a hint of coconutty flavor. If you are not a fan of coconut, you could swap out coconut oil for a refined coconut oil. Sure, if you are into that kind of thing. If you want other ways to switch it up, you could add chocolate chips (I love these), peppermint candy chunks (that would make it not paleo or vegan anymore, FYI), or top with a caramel sauce. Ohh now I want to top this with caramel sauce. Medium Saucepan, baking dish (I used a 9×5), measuring cups and spoons, cocoa powder (like this one), coconut oil and a few other things. Are you ready to make this ridiculously easy fudge recipe? In a saucepan over medium-low heat, place all ingredients and allow to melt. Whisk together and pour into a container lined with parchment paper. Chill for an hour or stick it in the freezer for about 30 minutes. Lick the bowl clean. Slice and store in a container in the fridge. 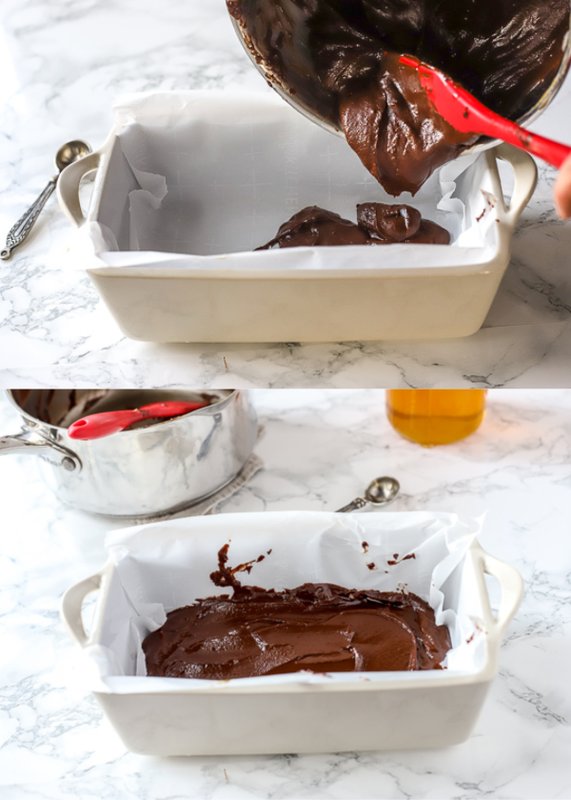 This fudge will melt if it gets too warm. Need more delicious dessert recipe? Check these out! 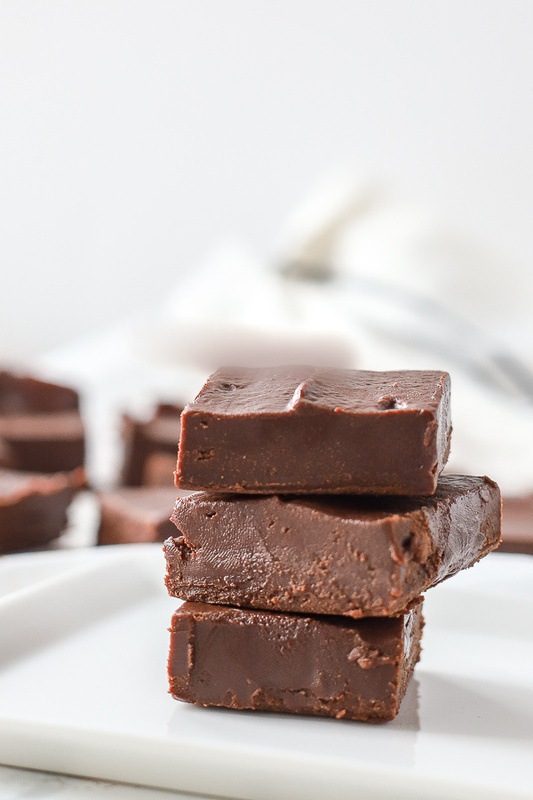 Decadent and chocolaty vegan fudge with the perfect, fudgy texture. You would never believe this recipe is healthy. If you try this recipe and love it make sure to come back, leave a comment and give it 5 stars. Thanks! 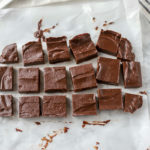 Rich chocolate vegan fudge with a smooth creamy texture... you would never believe that this simple fudge recipe is healthy. 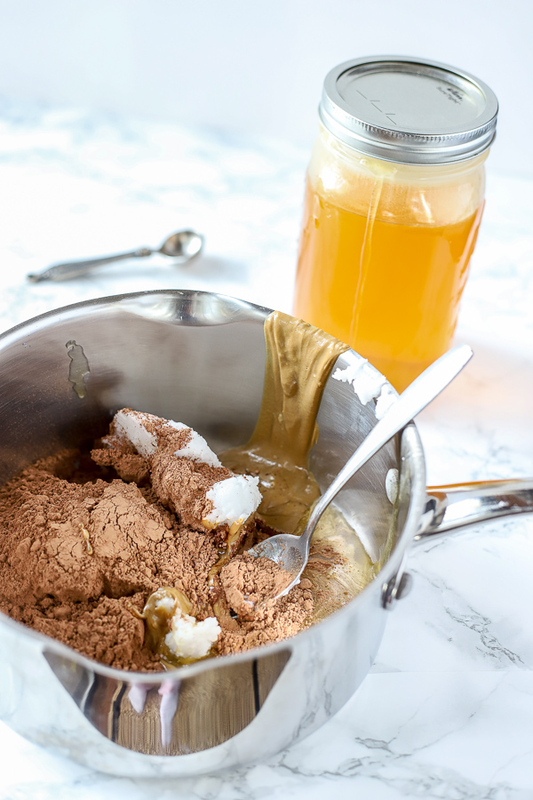 Combine coconut oil, cocoa powder, honey or maple syrup, and nut or seed butter into a medium saucepan. Turn heat to medium-low and allow to melt, mixing frequently (make sure that seed butter dissolves). Once combined and melted, take off of heat and add vanilla extract. Combine well. 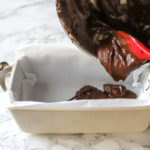 Pour fudge into a parchment lined dish (I use a 9x5 dish) place in the fridge until firm. Should take about 30-60 minutes. Cut and enjoy. Try not to eat them all yourself. This recipe is pretty sweet. If you want to make it less sweet, take the honey or maple syrup down to 1/4 cup. It should still work just fine. Pop them into the freezer for 20-30 minutes for faster cooler time. Don't leave them too long or they will get really hard. Store them in a cool place. They will melt if they are too warm. Have you made fudge before? What is your favorite kind of fudge? Chocolate chips are mentioned in the instructions, but not the ingredients. How much are needed. This looks really good. Oops! They are not needed but you can add them in if you would like. I will change that thanks Katie! Love how simple it is to make healthy dessert and it’s vegan, too! Decadent! Looks so delicious. Thanks for the step by step instructions! This fudge looks PERFECT. I wish I could reach through my screen and grab some!